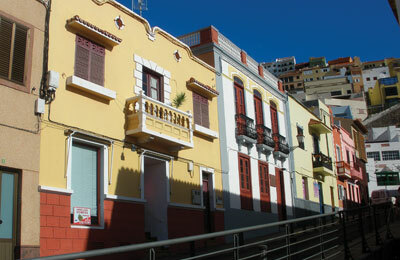 San Sebastien de La Gomera is the biggest town and the capital of the island of La Gomera. There are ferry links between San Sebastien de La Gomera and Santa Cruz de La Palma on the island of La Palma and Los Cristianos on the island of Tenerife. These ferries are operated by Fred Olsen Express. Below you can find San Sebastien de La Gomera ferry times, as well as our best deals. The beautiful and historic town of San Sebastian La Gomera is one of the less visited destinations of the Canary Islands. The island is well known for being the place that Christopher Columbus prepared his ships before he sailed to America in 1492. The Church of La Asuncion in San Sebastian, where he and his sailing crew attended mass, still stands today and is well worth a visit. The island itself is almost the polar opposite of the nearby island of Tenerife. 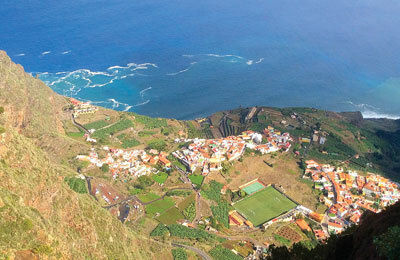 It has been described as the Canary Island that mass tourism forgot. Although only about 15 miles from end to end, crossing the island is like crossing continents. Down at the coasts, you'll find deserts and palm trees, trek inland towards the volcano that lies in the centre however and you'll come across green forests packed with dense natural vegetation. The island's geography mean that there's only a small airport making ferry travel a much more realistic way of reaching the island. However, don't be deterred, visiting La Gomera is a great way to extend any holiday - and add a whole different dimension - to any holiday in Tenerife. And the hop is only about 40 minutes long. If you come from Tenerife expecting more the same, you may in for a disappointment - or a pleasant surprise - depending on what you're after. Restaurants mainly shut at around 10pm and you won't find any clubs - just a few sedate bars. In fact, La Gomera is far better know for it's wildlife than it's nightlife. Travelling to the interior is well worth it and so is taking advantage of one or more of the many hiking trails. The Unesco-listed Garajonay National Park in particular should be on any visitor's itinerary. This densely packed park shows how much of the area and the mediterranian would have looked were it not for man. It really is like walking on the set of Jurrasic Park. Of course there is a lot more to do and see on this stunning and historic island, but we hope for now that you're convinced it's worth a visit. But don't tell all your friends. We want this jewel of an island to retain it's non-touristic charm. San Sebastien de La Gomera is the main town and capital of the island and the main port is situated here with connections to the port of Los Cristianos on the island of Tenerife and the port of Santa Cruz de La Palma on the island of La Palma. The island is also known as "Isla Colombina" as this is where Columbus prepared his ships before travelling to America. As it is not a very large port, there are only basic facilities including parking and shaded waiting areas. However, as the town is nearby, if waiting for a long time, you can avail yourself of the cafés and restaurants in town. The palm-fringed Plaza de Las Americas is a short walk away. San Sebastien de La Gomera Ferry port is easily reachable from anywhere in the island as it is situated in town (about a 15 minute walk from the centre). It is next to the marina. The island has a frequent bus network with daily busses to all the main destinations of the island and so finding a bus to the town of San Sebastien should be easy. However, please check timetables as there may be more frequent busses in the summer months.